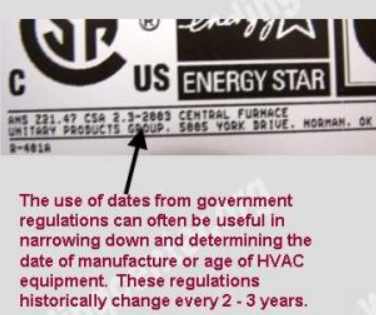 How to determine the date of production/manufacture or age of Applied Air® HVAC Systems. The date of production/manufacture or age of Applied Air® HVAC equipment can be determined from the serial number located on the data plate. Unfortunately we are unable to determine the date of manufacture or age of these units. Perhaps you can assist us in our research with additional information. Using the ANSI or CSA standards to determine approximate Date of Manufacture. Most manufacturers today are required to include the manufacture compliance standard on the data tag. For the U.S. the compliance standard is typically from the American National Standards Institute (ANSI). For Canada, a common standard compliance is through the Canada Standards Association Group (CSA). Many times both standards are listed. Regardless, the specific standard will normally be listed on the data tag/plate and followed by the YEAR of the last revision (often the year is placed in parenthesis or follows the hyphen after the specific standard number). As these standards are revised or renewed approximately every 4 to 6 years, one can reasonably estimate the year of manufacture within 4-6 years from (after) the standards date. This area has been reserved for any special considerations that inspectors or HVAC equipment owners should pay particular attention too. Access to this information requires membership. Any of the trademarks, service marks, collective marks, design rights or similar rights that are mentioned, used or cited in the articles of the Building Intelligence Center (www.buildingcenter.org) are the property of their respective owners. Their use here does not imply that you may use them for any purpose other than for the same or a similar informational use as contemplated by the original authors of these articles under the CC-BY-SA and GFDL licensing schemes. Unless otherwise stated Building Intelligence Center (www.buildingcenter.org) sites are neither endorsed by nor affiliated with any of the holders of any such rights and as such Building Intelligence Center (www.buildingcenter.org) cannot grant any rights to use any otherwise protected materials. Your use of any such or similar incorporeal property is at your own risk. This guide is intended to assist Commercial/Residential Building Inspectors, HVAC professionals, Facilities Managers, HOA’s, etc.., in determining the date of manufacture and/or age of HVAC equipment to determine the expected useful life (EUL). This web site should not be relied upon for commercial use or interpretations. Accuracy and reliability of the information provided is believed accurate but is not guaranteed. The burden for fitness of information provided relies solely and completely with the user. In no event will Building Intelligence Center or its representatives be liable for any loss or damages whatsoever for consequential, incidental, indirect, special, or tort damages of any kind, including but not limited to loss of data, lost profits, business interruption, loss of business information, or other pecuniary loss that might arise from the use of or reliance on the information provided within. We’ve been forced to move to more powerful website resources in order to accommodate the ever increasing website traffic. Your financial support is greatly appreciated to help us to continue maintaining this site for your use! Please consider a donation. Any amount from just a small fraction of daily users who rely upon this FREE resource will help offset our personal costs. A very heartfelt THANK YOU to those who have donated and/or reached out to extend offerings of assistance during our tranistion. We greatly appreciate your continued support. Your donations have helped reduce our personal costs in maintaining and improving this site.